The second quarter proved to be a bit bumpy for equities but regardless, each of the benchmarks listed below finished the quarter ahead of their first-quarter closing values. April saw equities end the month ahead of March, buoyed by favorable corporate earnings reports, proposed tax cuts, and strong foreign economic advances. During the month, the Nasdaq led the way posting monthly gains of 2.30%, followed by the Global Dow, which gained almost 1.50%. The large-cap Dow advanced 1.34%, ahead of the S&P 500, which increased close to 1.00% for the month. Even the small-cap Russell 2000, which has had some rough weeks, closed April 1.05% ahead of its March close. May was a slower month as consumer spending and wage growth were relatively weak, with only 138,000 new jobs added in May, compared with an average monthly gain of 181,000 over the prior 12 months. Nevertheless, only the Russell 2000 lost value, falling 2.16% from its April closing mark. Nasdaq continued to surge, ending May with a monthly gain of 2.50%. 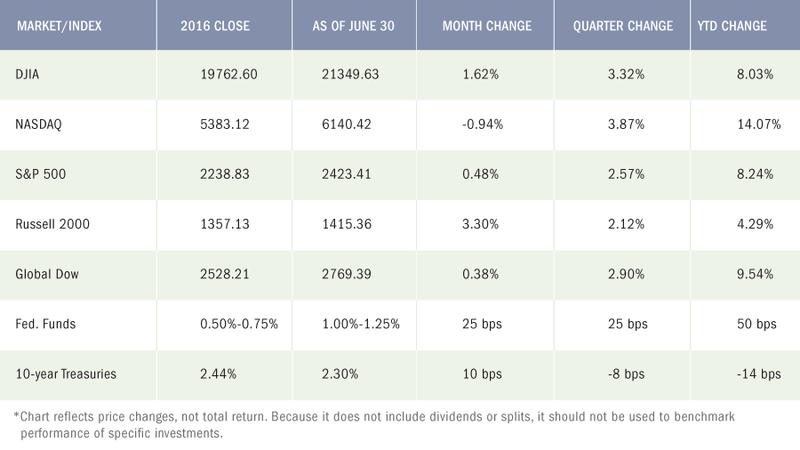 June saw mixed results for equity indexes with the Nasdaq losing almost 1.00%, while the Russell 2000 made up for its May losses, advancing almost 4.00% over May. The Dow had a strong June, closing the month up 1.62%, while the S&P 500 and the Global Dow failed to advance over May. Long-term bond prices increased in the second quarter with the yield on 10-year Treasuries falling 8 basis points. The price of gold fell during the second quarter, closing June at $1,241.40, down from its $1,251.60 closing price at the end of the first quarter. The second quarter proved to be a bit bumpy for equities but regardless, each of the benchmarks listed below closed the quarter ahead of their first-quarter closing values. US Equity Markets. It’s hard to argue with the fact that equity markets have been extraordinarily resilient in 2017. There have been many headlines and events that could have sparked a broad selloff that would last more than a day. What we have witnessed instead has been plenty of buyers emerge whenever a selloff begins and it has primarily been internal rotations of funds out of one market sector into another. Given the extent of the gains we have witnessed (especially in the technology sector), we do still believe that it would be healthy for the markets if we had a slight pullback or correction. With the Summer now upon us which usually means less volume, volatility could spike. We have always been big believers that economic and corporate fundamentals will always rule the day. To that end, corporate earnings momentum seems intact and indications suggest that the economic expansion has deepened globally and is now more synchronized. There is now participation of nearly every major world economy and the data includes: improving labor markets, accommodative monetary policies, supportive financial conditions, favorable investor sentiment, and the potential for additional fiscal stimulus. All of this suggests that barring any unforeseen major event, the global expansion should persist and in our opinion, equity markets around the globe could continue on their strong path. However, this is not to say that a correction could still not take place. 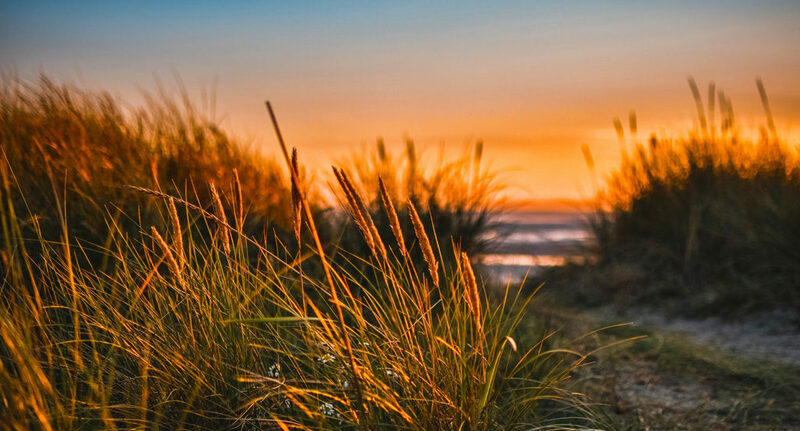 Complacency is never a good thing and we are therefore taking a cautious approach with an eye towards taking profits when we see overvaluations, maintaining diversification, hedging and protecting our client assets. International Markets. With global growth expectations on the rise, we see room for more upside surprises in the ongoing global recovery that is continuing to improve corporate earnings abroad. The strong prospects for earnings growth, combined with reasonable valuations overseas, makes international equities appealing to us. Think “Global”! Fixed Income. Resiliency can also be used when discussing the state of the fixed income markets. While we did see rates drop earlier in the quarter as measured ny the 10 year Treasury bond, we do expect the trend of higher rates to resume. This thesis is driven by the evolution of the Federal Reserve’s monetary policy, the continued global growth discussed above. While we see a low probability of a sharp and sustained surge in yields, our outlook for bonds is less optimistic than that of equities. Fixed income assets are likely to be challenged amid broadly rising interest rates. We want to emphasize the importance of maintaining diversification in your fixed income allocations, keeping maturities and duration relatively short and a having a dynamic approach to fixed income investments. As always, we at Premier Wealth Advisors are here to assist you and answer any questions you may have. May’s employment report showed unexpected weakness in the labor sector with 138,000 new jobs added in the month, on the heels of 174,000 new jobs added in April, revised. April and March were revised downward to a combined 66,000, which, when coupled with the average gain of 181,000 over the prior 12 months, clearly shows that job growth is slowing. For May, job gains occurred in health care, mining, and professional and business services. The unemployment rate dipped to 4.3% — down from 4.4% in April. There were 6.9 million unemployed persons in May. The labor participation rate inched down 0.2 percentage point to 62.7%. The average workweek was unchanged at 34.4 hours. Average hourly earnings increased by $0.04 to $26.22. Over the last 12 months ended in May, average hourly earnings have risen by $0.63, or 2.5%. Following its meeting in June, the Federal Open Market Committee raised the target range for the federal funds rate by 25 basis points to 1.00%-1.25%. This is the second interest rate hike in 2017, with the first coming in March. In support of its decision to raise interest rates, the Committee observed that economic activity has been rising moderately so far in 2017, business spending has continued to expand, and, while job gains have moderated, the unemployment rate has declined. Noting that inflation has slowed in the short term, the Committee expects inflation to stabilize around 2.0% over the medium term.